Does your hockey player have lead in their pants? 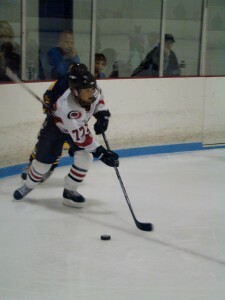 Does your hockey player have “lead in their pants”? As a youth hockey player the hockey road trip made my weekend. Usually, a teammate would ride with us or I would hop in their car for between game trips, terrorizing younger siblings and playing “guess that smell.” The entire team would undoubtedly have a group lunch at Pizza Hut or McDonald’s, which came with the guarantee of one kid laughing the soda out of his nose and another one being dared to drink the dispensed with nose soda. It was a weekend ritual to see who could most embarrass their parents. I took the honor a few times. I still say I should have a historical marker at the Arby’s in Burlington, VT for an incident that my mom will publicly deny. If we were lucky, the games would have enough distance from home to require a hotel stay which meant hall hockey – a favorite hotel pastime and bane of hotel security. Rule number three of hall hockey stated, “Upon having said game disbanded by hotel security or an unaffiliated adult immediately retreat to the floor directly above or below and commence play.” We never ran out of floors. Sleep was impossible every Friday night between September and March with the excitement of another hockey weekend only a sunrise away. I still get just as excited in my relative maturity for adult hockey tournaments. It’s the same childhood experience with the same behavior, but with no adult supervision. In fact, “adult tournament” is kind of an oxymoron. These were standard parental inquiries. They also marked the start of a dreaded one-way conversation to be expected in my car following a poor performance as we trekked across New England, New York, and Canada seven months out of the year. To be sure, positive parental encouragement – an undeniable necessity – was showered upon me. As much as the questions that defied the laws of physics were expected after a bad game, so too was the glowing praise after a solid effort that would keep a smile on my face until school started on Monday morning. A parent’s pride is like a superhero’s cape and the good games always vastly outnumbered the bad ones. The not so positive encouragement sticks with you though. I was never really bothered by the questions or criticism too much. It was the implication that there was intent to my bad game. I never wanted to have a bad game, but it happens. I was a kid. Who knows, I may have actually been asleep out there given that I was so excited about the game that I didn’t sleep the night before. For the record, this was the only question I was ever able to determine as physically possible. Can you blame parents though for the car ride interrogation after a poor performance considering the financial and physical commitment required of them? Some methods are certainly questionable, but you can’t question a parent’s right on this matter. If the player is not committed and not enjoying the game then why make the required investment? It was worse in the early years. House leagues didn’t exist, so every team was a travel team. Early morning practices and games, the cost of overnight travel, constant equipment upgrades for a growing boy, and parent politics were just some of the headaches hockey parents have to deal with and mine were no exception. My dad’s commitment was further compounded as a coach who left directly from work on weeknights to make practice an hour away, rinks not being as plentiful as they are now. It’s impossible not to mention the toll on younger siblings as well. I am forever indebted to my sister. Only in hindsight am I aware of how much she had to sacrifice because we were a hockey family. Unfortunately, there was only one hockey player so you can imagine where all the attention was focused. I have absolutely no regrets though. I am just sharing one person’s insight into a hockey childhood. 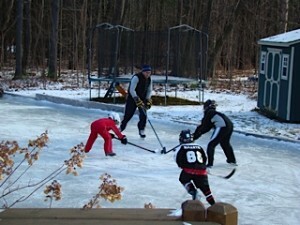 I still love this game and my parents readily admit how much they enjoyed being a hockey family. My sister is one of my best friends and is married to a hockey player now so she is well adjusted… or not. I still play the game and was able to play at some relatively high levels over the years. And at eleven years old, after performing an autopsy on my cooper-alls, I was able to discover that I did not have lead in my pants. Standing over the mirror proved inconclusive. The fact is there will be good games which need to be rewarded and bad games which need to be acknowledged. You can be tough to a degree because hockey is a tough sport and life will certainly present its own challenges. There are universal lessons to be learned. Will the child enjoy the criticism? Not if they’re normal. Just make sure your hockey player knows what you are talking about so they can grow from the bad and still enjoy the good. It’s a delicate balance, but it needs to be struck. Otherwise you will end up with a kid standing over a mirror looking for lead in their pants.